I was recently sent two bottles of R.W. Knudsen Family Just Juice – Just Tart Cherry and Just Pomegranate. I have been a fan of R.W. Knudsen Family juices since I first tried them years ago. Their juices are always delicious, have no preservatives, no artificial flavors, and they are a part of the Non-GMO project, which I love! The two juices they sent me are 100% pure juice with no sweeteners added. My kids tried both juices, and although they love very sweet things, they both thought this juice was tart, tasty, and refreshing. I loved how intense the fruit flavors are in each juice and couldn’t wait to make a recipe using them. R.W. Knudsen is offering two lucky readers one bottle each of R.W. Knudsen Family Just Juice. See the giveaway details below. We just ran out of lemon curd, and since my kids love it, I decided to make some curd using the tart cherry juice along with a bit of the pomegranate juice. I added a touch of natural food coloring to brighten up the red a bit. You can use regular red food coloring if you desire or leave the curd as is. 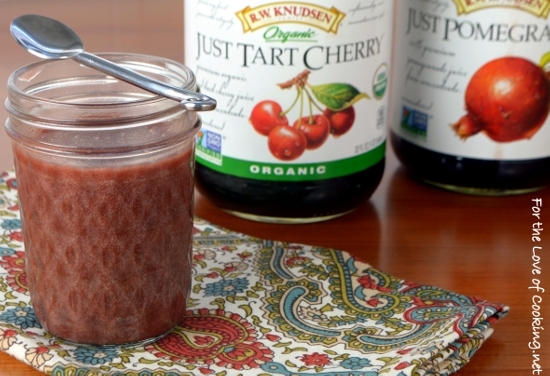 My kids both loved this tart cherry and pomegranate curd… it was sweet, tart, and super flavorful. I like to serve curd slathered on toast, waffles, pancakes, or crepes and drizzled on ice cream. Combine the zest of 1 lemon and the white sugar together with your fingers until it’s well combined and the sugar is fragrant. Set aside. Cream the butter with a hand mixer until creamy and smooth. Add the fragrant sugar and blend until well combined. Add the eggs, one at a time and mix thoroughly. Add the Just Tart Cherry Juice, Just Pomegranate Juice, lemon juice, and salt then blend until well combined. Pour into a small sauce pan and cook over medium heat, stirring often, until thickened, about 10 minutes at about 170 degrees. Remove from heat and let cool before pouring it into a container. Side Note: If you accidentally overcook the sauce, it may curdle a bit. Simply pour through the fine mesh strainer to remove any clumps. Serve over crepes, pancakes & waffles, toast, ice cream, muffins, or sugar cookies. Store, well sealed, in the refrigerator. Enjoy. R.W. Knudsen is offering two lucky readers one bottle each of R.W. Knudsen Family Just Juice! Comments will close at 7:30 pm pacific time on Thursday, January 14, 2016. Winner will be chosen at random and will be posted on this website on Friday, January 15, 2016. Be sure to include an e-mail address with your comment. Two winners will be chosen randomly and announced on Thursday, January 14, 2016. I will email the winners and if the winners do not respond within 48 hours, new winners will be chosen. Product will be shipped directly to the winner by R.W. Knudsen Family. Disclosure: R.W. Knudsen Family sent me this juice and they have provided two other bottles for this giveaway, at no cost to me. Click the link for more information about Just Juice and other R.W. Knudsen products. You can also visit them on Facebook and Twitter. I really like Knudsen juice. I use their cranberry juice to make cranberry water for my “long life cocktail,” which is a fiber drink. I actually love the R.W. Knudsen juice brand, I just brought some of their sparkling apple cider and spice apple cider it was very good! i absolutely love cherry juice! I would like to enter the give away. I enjoy your juices.I even try different recipes with them. Never heard of it. Can’t wait to try it! Those are my two favorite fruits… I’ll have to find a store that stocks them! The recipe sounds wonderful too. Oooh! I have made lemon curd before but have never thought to do pomegranate curd. How pretty! You had me when I saw cherry and pomegranate. I have pomegranate seeds whenever I can get them and I love love the juice and I love cherries. I have not tried tart cherry juice though. Sounds soothing. I could live on lemon curd, but never though there could be another flavor. I would love to make this! I have never tried any of the R W Knudsen juices, but have read many good reviews on them and would love to try them. In order to make a holiday drink Bev and I went to several stores and never did find plain pomegranate juice – guess we weren’t looking for this brand. 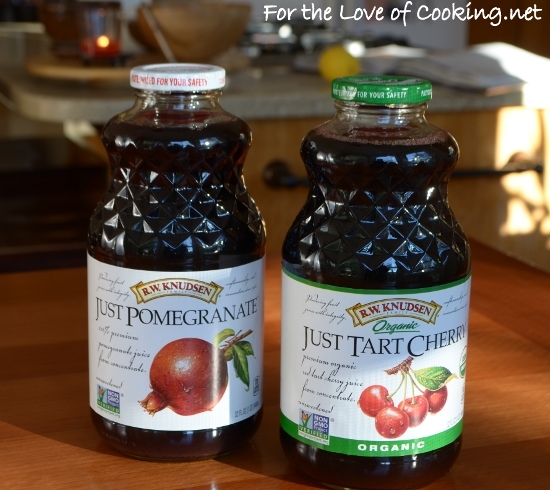 I love their tart cherry juice and the sparkling apple juice they have, very high quality products! This is a brand that’s nee to me. My kids love juice! I’d love to try the juice – thanks for the giveaway! Sounds like a great juice! Thanks for the giveaway! Wow! I’ve only ever made lemon curd so I can’t wait to try this, YUM! You’ve created another fine treat here, Pam! I’m sure you all enjoyed this very much. I drink this tart juice everyday to help relieve the pain in my feet from gout. The curd looks very delicious! I hear these juices are great! I have had Knudsen juices before and they are great. Can’t wait to try the curd recipes. Love Knudsen juice… I had their cranberry over Christmas mixed with some champagne for cranberry champagne cocktails! I never had cherry juice before, but I’m sure it’s delicious! I would love to try both of these! Thank you so much for the chance. We would love to try Knudsen’s juice. It sounds delicious! Thanks! Wow – I need to pay more attention at the store! I had no idea about these juices. Definitely need to give them a try. Sounds delicious. So does the curd recipe. Never thought about using any juice other than citrus for curd. 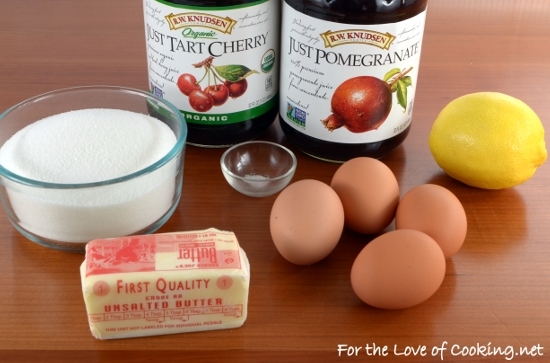 Will definitely give this a try when making my next batch of tarts. Thanks for the suggestion. 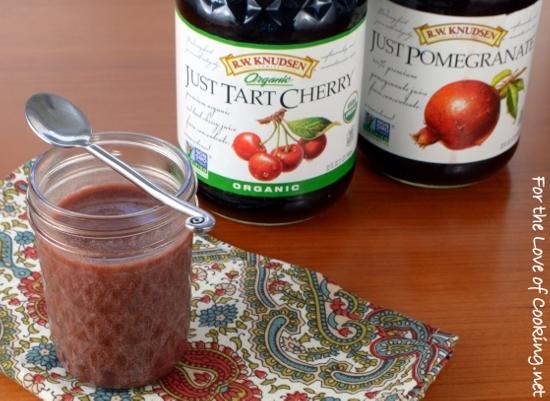 Love the Tart Cherry Juice, I often drink a small glass right before bed. I am anxious to make the curd and try it too. Love their simple, natural ingredients!